Some things are meant to be amazingly peculiar. There are interior designs that will amaze you with its creativity and uniqueness. Some styles are well loved by many others are not. Many find it easy to love those designs that are commonly seen or the traditional ones. The designs that are sweet and safe. Those that are not complicated in nature. However, there are those designs that deviate from the norm. These are the designs that are only appreciated by few or shall I say, not for the faint-of-hearts. Industrial design is a no nonsense-kind-of style. It is straightforward and it does not include any luxurious, cushy furnishings in it. It is loved for its minimalist nature, strong ,clean lines and raw, utilitarian appeal. It gives any room a sophisticated edge. 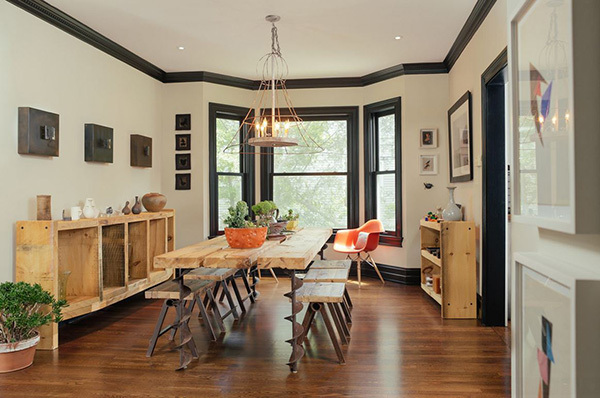 In today’s article you will witness how industrial design works in a dining room. 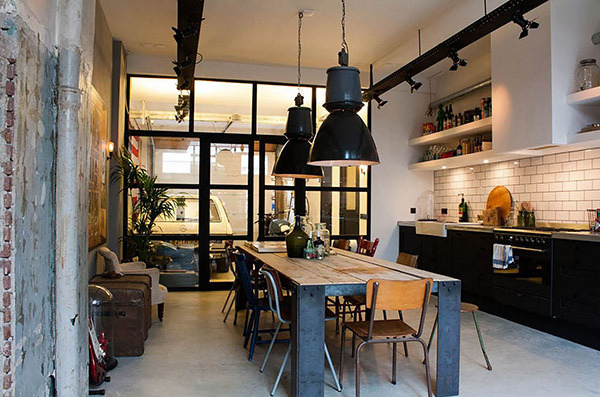 I personally love the raw and edgy feel these 20 Industrial Dining Room Designs bring. 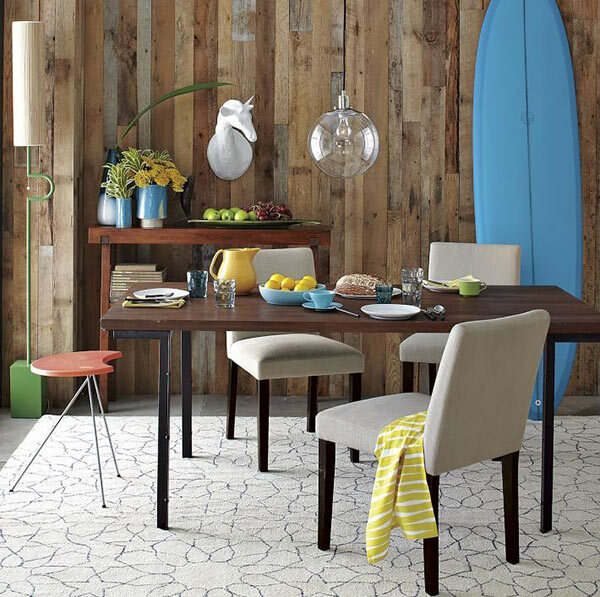 Take a closer look at these incredibly styled dining rooms and enjoy! 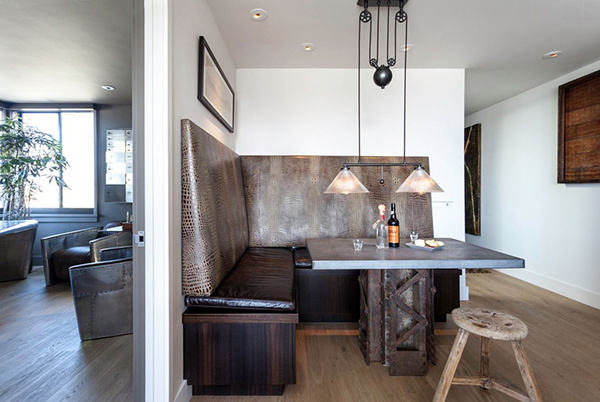 Concrete, wood and steel combined to create this cozy, masculine dining room design. I love its oversized industrial pendant light, steel-framed downlights, reclaimed steel table and mismatched wood-steel chairs because it bring a moody yet sleek atmosphere in this boy’s dream dining room. Need I say more? This bold and edgy masterpiece is shouting industrial design in every inch. The open floor plan offers a continuous space. The reclaimed wood aesthetic, exposed steel columns and wood beams bring warm and coziness while the pendant lighting in satin nickel and the reclaimed piece of industrial machinery with glass table give its elegant look. The leather booth against the clean white backdrop gives a cozy, vintage flair while the steel table, wood bar stool and industrial pulley pendant lighting create a chic and urban feel to this dining room. The crisp, white walls makes a great backdrop for this stylish dining room. 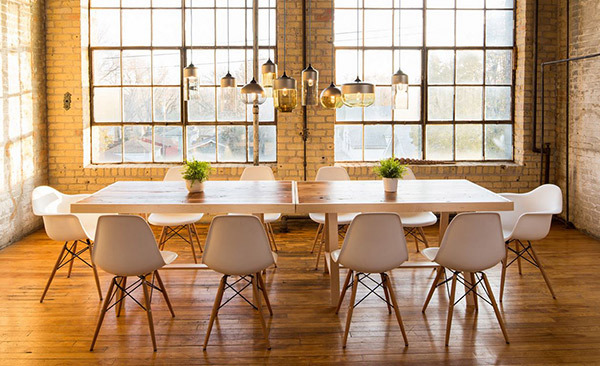 The white, sleek chairs pulled together with the reclaimed wood and steel table and chairs accentuated by a vintage skylight bring a contemporary feel to this industrial dining room style. 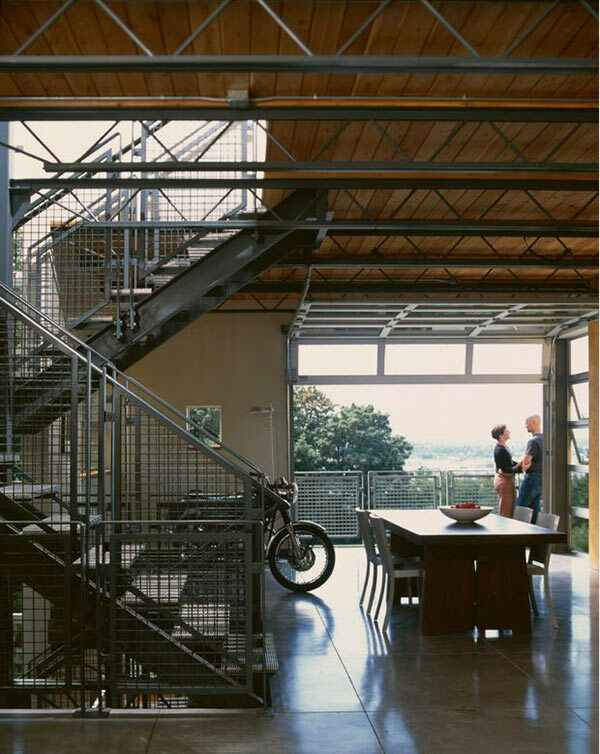 I love the open-web-steel-joists for an open ceiling effect. The contrast in wood and steel on the ceiling is resonated to the dining furniture giving a sleek yet soothing vibe. Gorgeous pendant lights! 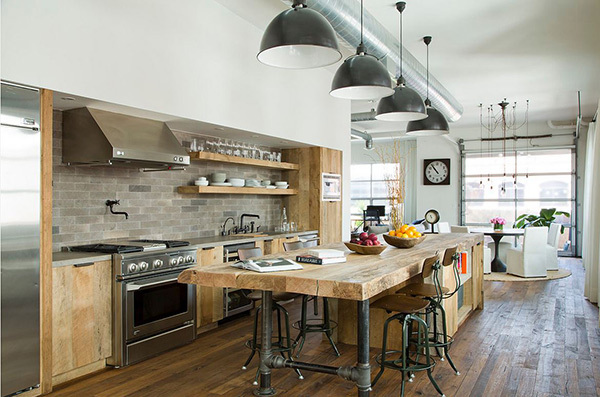 The industrial elements on this kitchen continue to the dining area which brings a cozy yet sleek feel. 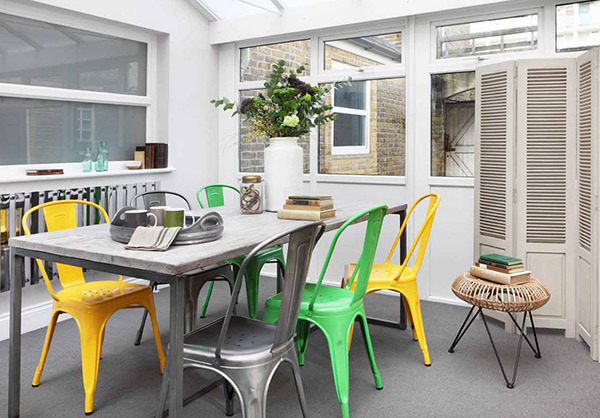 Adding a pop of vibrant color makes an industrial dining room fun and interesting. Brightly colored Tolix chairs surround a reclaimed timber dining table with steel frame makes an industrial dining room lively and casual. 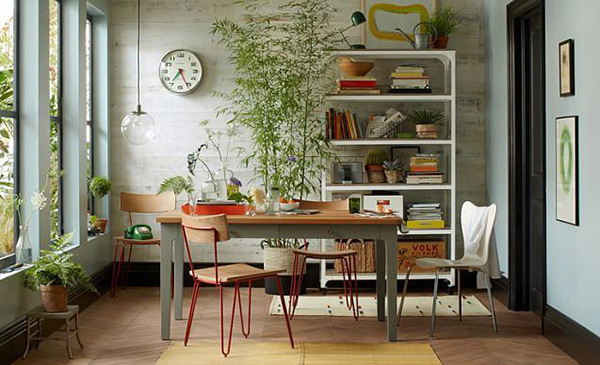 Combination of rustic and industrial components create a charming ambiance in this dining room design. 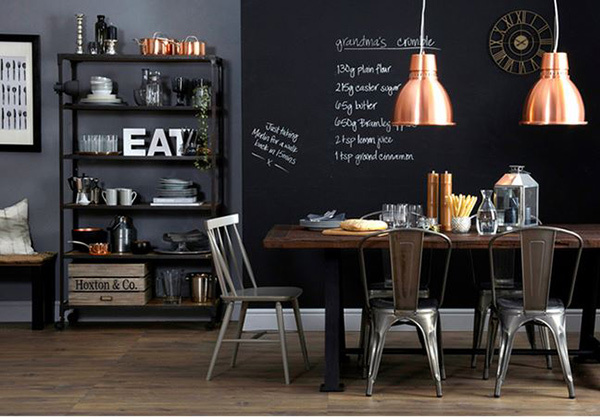 The black board on the wall makes an interesting canvas to this moody industrial dining room design. Wood, steel and copper touches make a stunning combination. 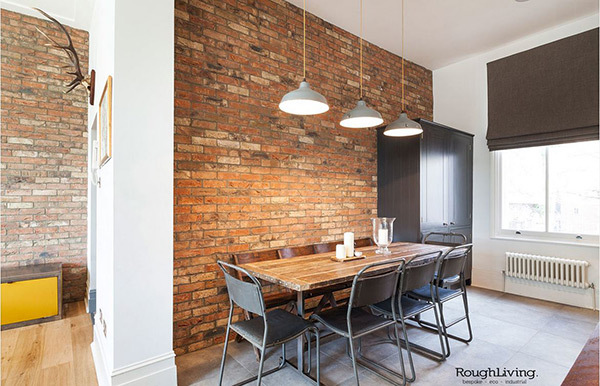 The good-rough-texture of the wall brings raw and edge to this charming industrial dining room. 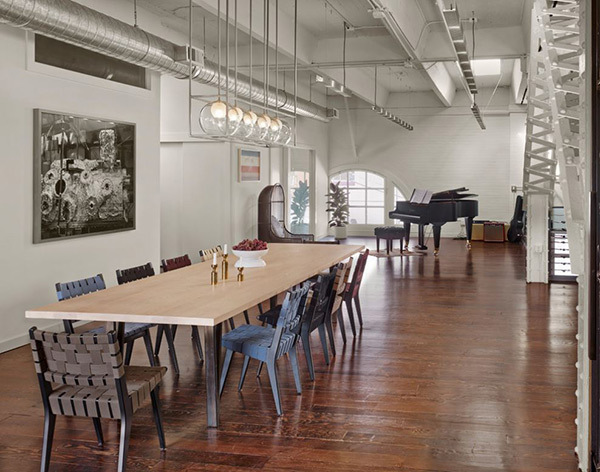 The silver-gray tone that echos across the room gives a relaxing yet luxurious feel to this industrial dining room design. The rusty color that graces from the wall to the dining custom-design furniture preserves its vintage flair without compromising its cool mod vibe. 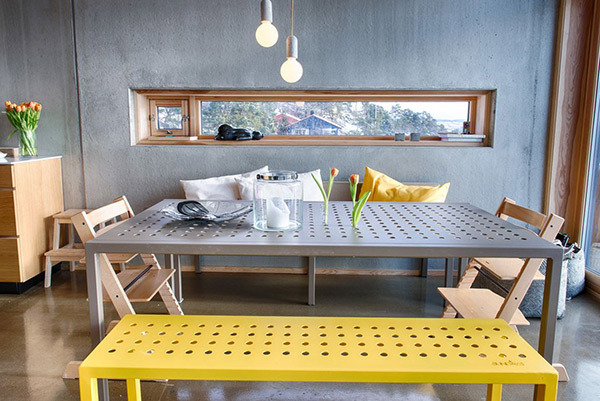 A honeycomb-table with industrial pipe legs paired with modern chairs make an incredibly lovely combination. 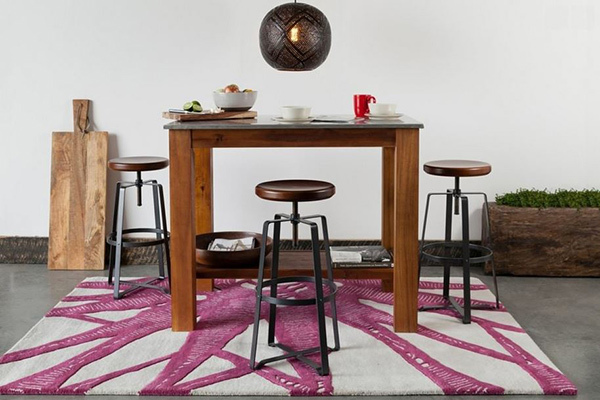 The masculine nature of industrial style is soften by a stylish area rug and modern furnishings. 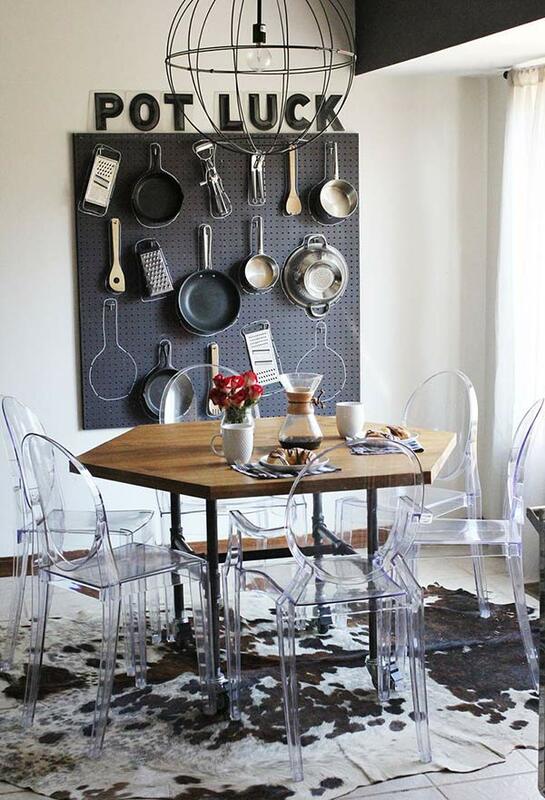 Bold yet charming industrial dining room design with the right amount of texture and patterns used. A touch of pink on the wool area rug makes this dainty industrial dining room romantic and feminine. 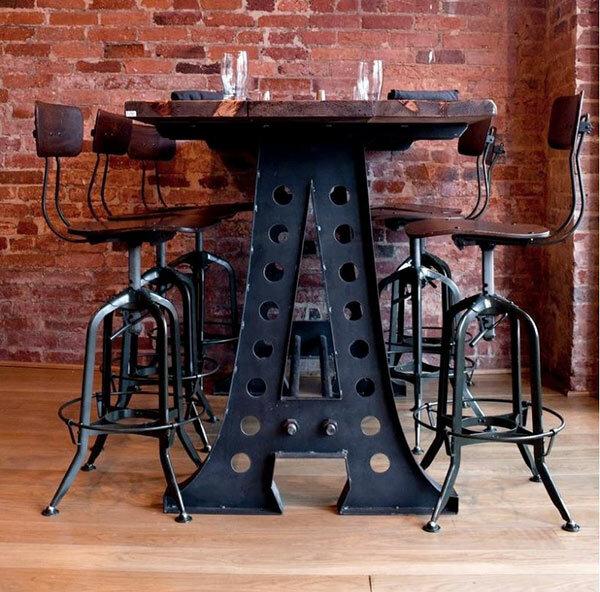 This emulation of old cast iron for a table makes a bold and striking accent against the exposed brick wall in this industrial dining room design. The shabby-chic nature of a cottage-style dining room is seen on the light, wood and white color scheme infused with industrial elements creating an airy and easy feel in this inviting dining room. I love the interior of exposed-brick-wall and huge, steel-frame-window set as a beautiful backdrop for this stunning industrial dining room design. The parallel series of pendant lightings add a romantic touch while making it cozy and inviting. 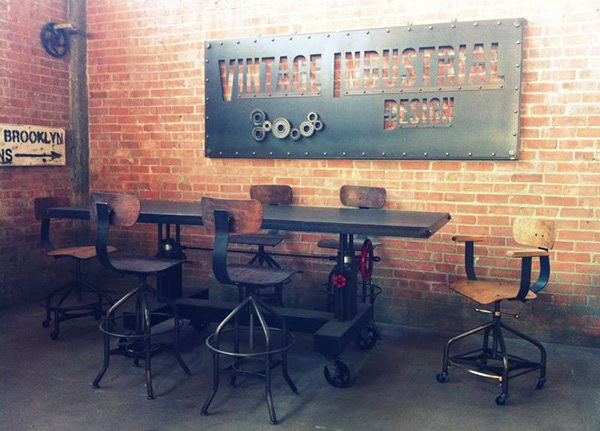 Industrial dining room designs are naturally bold and striking in its nature. Its utilitarian nature makes it appealing to those who would like to have a stylish interior but would like to reuse vintage or salvage furnishings. 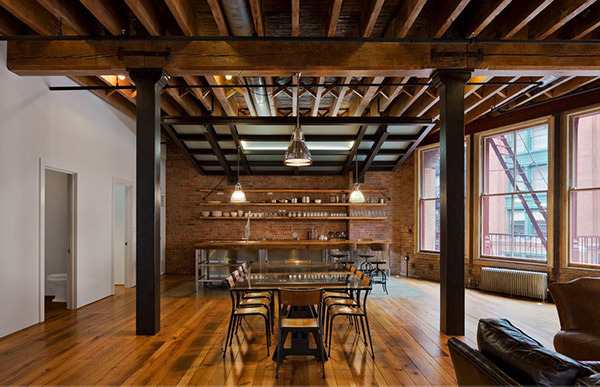 The combination of wood, steel, concrete, exposed beams, columns, brick walls and the like are basic elements for pulling an industrial look. Adding a feminine touch or a vibrant color will absolutely bring an extraordinary note. 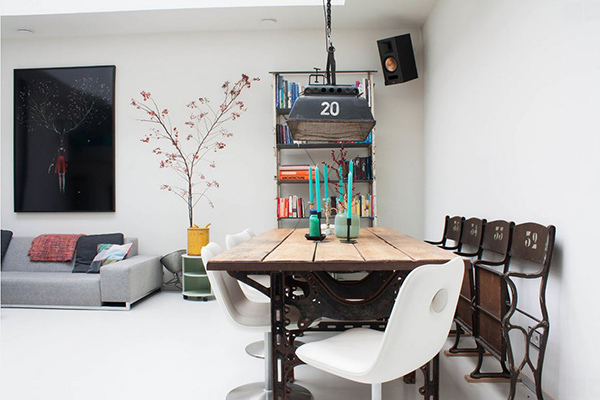 Industrial dining room is naturally inviting, bold, explicitly beautiful and modern. 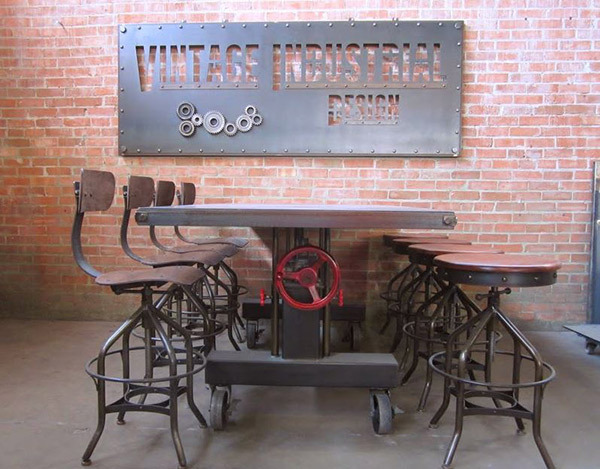 So if you are looking for something different from the usual style I suggest go for an industrial dining room for a more urban and distinct look.